"On September 6, the U.S. Department of Justice prosecuted what they call a DPRK citizen named “Pak Jin Hyok” as the principal offender to the Federal Justice Court in Los Angeles for hacking attack into the American film company “Sony Pictures Entertainment”, an incident that happened in 2014." However, the names on all US news articles, FBI posts and the criminal complaint do not include the alias “Pak Jin Hyok”. 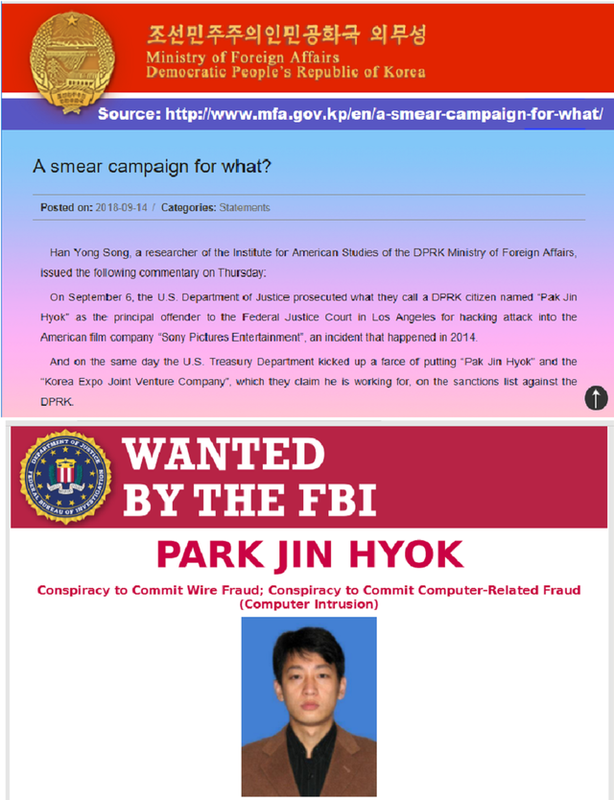 The US has used "PARK JIN HYOK" as the primary name and "Pak Jin Hek" and "Jin Hyok Park" as known aliases. Why would the DPRK Ministry of Foreign Affairs post a statement from a researcher, who used the wrong name to refute US accusations? Song said “Pak Jin Hyok” "is a non-existent entity" and I doubt anyone paying attention to the subtle name change would dispute that. Everything said in the statement is TRUE by virtue of the name of the accused being incorrectly stated by Song. Symantic games, perhaps? Or does Song know the face of the accused as the person named Pak Jin Hyok? "The U.S. should seriously ponder over the negative consequences of circulating falsehoods and inciting antagonism against the DPRK that may affect the implementation of the Joint Statement adopted at the DPRK-U.S. Summit at the crucial time for moving toward building mutual confidence in accordance with the spirit of the Joint Statement, and should control itself." The same could be said of any of the US's international relations. Diplomacy is appropriate at all times and with all foreign states. Regardless of a nation state's power, leading with force is barbaric. The US, having filed a complaint against a "non-existent entity" rumored to be a DPRK citizen, hasn't succeeded in gaining the support and cooperation of the DPRK government. Who's gaming now? Does anyone actually want to apprehend a hacker, or are both governments playing small bit parts in the war theater again? A smear campaign for what? The man has allegedly been behind massive cyberattacks for the last four years.